Relax to the surreal sights and sounds of nature from the comfort of your own home. while learning their natural habits without disturbing them. Even pets are amused and find the observatory an entertaining pastime. footage for media rich lovers and your children will enjoy showing off the little critter video they capture on youtube and social media. A learning tool like no other, bring the gift of nature to your children and evoke their imagination like never before. Keeps your loved ones mesmerized with nature's wildlife within touching distance. Weather proof and housed for water drainage from rain and melting snow; perforated housing promotes continuous liquid drainage of water, and reduces seed spoilage. INTIMATE VIEW | CLOSE UP VIEWING: Brings nature's beauty to your front door in suburbs and in wooded areas. Enjoy birds foraging for food and learn their habits from the comfort of your home. Built with transparent acrylic glass for crystal clear observation, and provides a treasurable experience your entire household will find pleasurably entertaining. 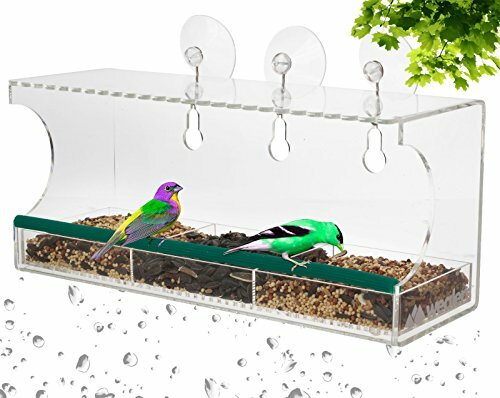 LARGE CAPACITY | MULTIPLE SECTIONS: Equipped with a large sectioned seed tray that holds lucrative amounts, allows you to alternate feed type in each compartment to attract different species; Cardinals, Finches, Chickadees, or Doves. The bottom of the housing and tray are conveniently perforated for liquid drainage, and it is mildew resistant. EASY INSTALLATION | CLEANING: Weatherproof and simple to mount or break down for snappy cleaning. Dismount the apparatus; remove the tray to gain access to the bottom of the housing for washing. When complete, dry and remount your feeder for endless moments of enchanting viewing pleasure. PORTABLE | INTERCHANGEABLE: The device is lightweight and portable so you can alternate its location around the home. Place it in the garage window, kitchen, or office window to attract birdies and enjoy a remarkable display of nature, at its finest. PRACTICAL: If you feel the need to purchase expensive bird watching equipment (binoculars and scopes) to enjoy nature; our bird perch and viewer is a cost effective alternative to bringing Mother Nature's splendors right to you! Durable, weather resistant and squirrel proof, it is the perfect companion for bird lovers around the world.